On the morning of a client’s big website redesign launch, the team at Top Floor has a few traditions: mimosas will be shared, stories of struggle and conquest will be told, and last but not least there will be a minimum amount of 500 google searches from the SEO team who are anxious to see if any big changes have happened. What if they missed a redirect from the old site and the client’s biggest page is serving 404 errors causing people to flee to their competitors? Was the new structure of the site going to pay off and help attain that dream keyword? These are all questions my team has been asking these last few months because Top Floor just went through a website redesign ourselves. In order to give you the best insight and advice on redesigning a website with SEO in mind I will tell you the steps we took to make it happen, as well as show you an example keyword that we had some success with. 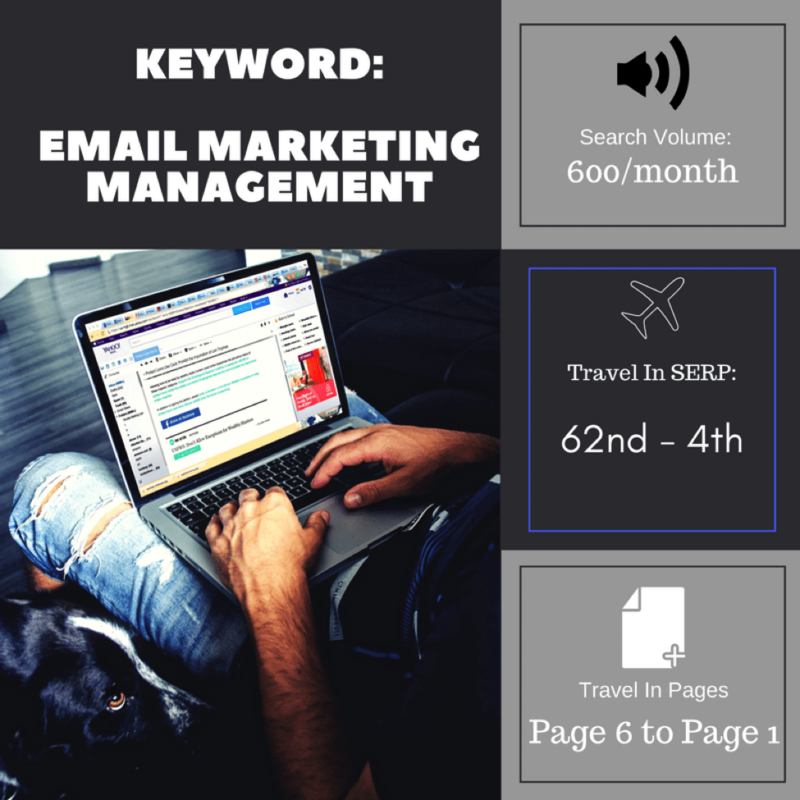 I’m not going to give out the secret sauce that is Top Floor’s biggest focus keywords, but I’m going to break down one keyword that had a good amount of travel in ranking just days after our redesign, and that keyword is: email marketing management. It doesn’t have “blow you out of the water” search volume, but it can get as high as several hundred queries per month. Also, there are plenty of PPC campaigns you can find at the top of that SERP (Search Engine Results Page) that would love to organically rank where we do and not have to pay for the traffic. All-in-all, it’ll be a great example to show off what we did and why when doing our redesign. These are important questions because it helps direct what keywords we keep, what we change, and what we hope to achieve. In our ‘email marketing management’ example, our internal marketing team decided that that was something we wanted to ramp up and go after, among other things. After keyword research confirmed it was plausible and worth it, we continued to the next step: structure of the redesign. One of the more interesting moves that I was excited about on our new website was the site structure. We revamped our navigation on our site quite a bit. We went from two main menus on our homepage to one beefed up navigation menu. We did that to help user experience which is a significant Google ranking factor. We also updated the URL structure as well. Our email marketing management page went from: /digital-marketing-services/content-marketing/email-management to a more simplified /services/email-marketing. A simple rule for user experience and Google ranking is to keep it short and simple. The fewer steps to get to a page the better for everyone and this can definitely be seen by our change in URL structure. Once we had our targets and goals, we made sure that our biggest keywords and services had their own dedicated, well written page. This included a redesigned page for our example keyword. While we already had a page for this topic, we added 4 extra paragraphs and multiple images after the redesign. Our word count went from 150 words to 479 and many of those were LSI (Latent Semantic Indexing) keywords that helped boost our page relevancy for the keyword. Another extra section of this page came from added blogs and case studies. What would improve the user experience for someone interested in this service more than having them read about it with more detail and then have links to how we put it into action coupled with results? The phrase “content is king” is widely tossed around in the digital marketing space and this was a good example of that. Finally, another big thing to consider when doing a website redesign is making sure you don’t lose all of your authority from your old pages. You don’t want to have to start over on all of your pages after working months or years to get to where you were. Instead, you want to make sure that you transfer your authority from old page to new by uploading re-directs which does two main things: 1. It helps your rankings by telling Google that this isn’t a new page and that the ranking from the old page should go to the new one. 2. It helps user experience by re-directing traffic from old links to the new page. If we had a link to our old email marketing page from an older Facebook post and someone clicked on it, they would get a 404 error and it wouldn’t work. That’s why it’s important to clean that situation up and automatically re-direct all traffic from the old URL to the new one. Have any other questions or want to dive deeper into your website redesign? Feel free to contact us at Top Floor and we would love to work with you and make sure your new redesign goes as smooth as it can. Other than that, feel free to browse through our new redesign and see some of the changes we’ve made. Some of my other favorites are the Services page and of course the new Our Team page – definitely check out Ben K’s hover image, it’s hilarious.